A look at American hot dogs from sea to shining sea. The Fenway Frank could be in for some serious competition. The New England Patriots are rolling out hot dogs, bratwurst, and sausages named after the team, complete with the Patriots' logo on the package. 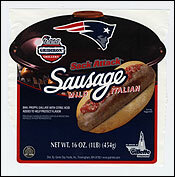 Starting this week at Gillette Stadium, fans will be able to choose from such selections as ``Patriots First Down Beef Frank" and ``Patriots Sack Attack Mild Italian Sausage." They will be available in grocery stores by early September. Team executives say the idea is a natural fit because of the sport's long association with tailgating and tailgating's long association with grilling. ``It's the social nature of football," said Murray Kohl, executive director of sales for the Patriots, Gillette Stadium, and the New England Revolution. ``It's bringing groups together. Food seems to be an important part." The Patriots don't plan to stop at meat; they envision an array of football foodstuffs. Not only are team executives mulling Patriots hamburgers and chicken wings, they also want Patriots barbecue sauce, ketchup, and mustard. Though Patriots executives say they are the first team in the National Football League to roll out its own meats, the idea has precedent. Red Sox fans already can buy Fenway Franks in grocery stores, and NASCAR last year launched a line of hot dogs and sausages -- and even created NASCAR bologna. The slogan: ``Taste the excitement." Just like football, stock car racing has a long association with food. The connection is one reason the idea could spread to more football teams, and even to other professional sports, said Jon Hickey , senior vice president of sports and entertainment marketing at Mullen , a Wenham ad agency. ``I can't believe I'm saying this about branded meat, but it makes a lot of sense," he said. ``It shows they support the things their fans enjoy." To name the new Patriots meat, the team solicited ideas from front-office staffers, who racked their brains for alliterative football-meat phrases. To pick the meat supplier, the Patriots food and marketing staff members tasted samples from suppliers around the nation. Of about 10 varieties tested, the new line immediately stood out, said David Wheeler, executive director of food and beverage for Gillette Stadium. ``I remember thinking that I loved the flavor," he said. ``It was juicy." Patriots players will dine on the meats as well. The team plans to offer them on the training table. The team will be supplied by Klement Sausage Co. of Wisconsin, which will pay the Patriots royalties once a minimum of hot dogs are sold. Since the Patriots pack in more than 60,000 fans per game, that adds up to a lot of meat. The Patriots already sell more than 50,000 pounds of sausages and hot dogs over the course of the season. They are introducing bratwurst this year, and expect that to boost meat sales by at least 15,000 to 20,000 pounds. The Patriots meat will replace the team's other sausages and hot dogs inside the stadium. 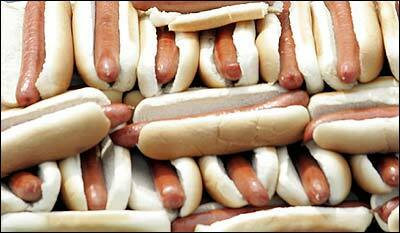 Fenway Park, by contrast, sells 1.2 million hot dogs per season -- roughly 152,000 pounds. The park seats fewer people than Gillette Stadium but has many more home games. Locally named frankfurters are common at ballparks around the country, including Dodger Dogs in Los Angeles, Dome Dogs in Minneapolis, and Diego Dogs in San Diego . The Patriots plan an advertising blitz in early September to launch the meats, including contests to win tickets and appearances by players in television commercials. The specific players have not been determined yet. Down the road, the Patriots aim to negotiate with restaurants to feature the products on their menus. Altogether, the Patriots are marketing nine ``Gridiron Grillers" meats -- four lines of bratwurst, three of sausage, and two of hot dogs. The label proclaims ``As served at Gillette Stadium." The plans for other Patriots' food items, such as barbecue sauce and chicken wings, are still in the exploratory stages. Ultimately, of course, the new foods will need names. Two unsolicited suggestions: ``Patriots Blitz Barbecue Sauce " and ``Patriots Catch it Ketchup." What makes a good hot dog?